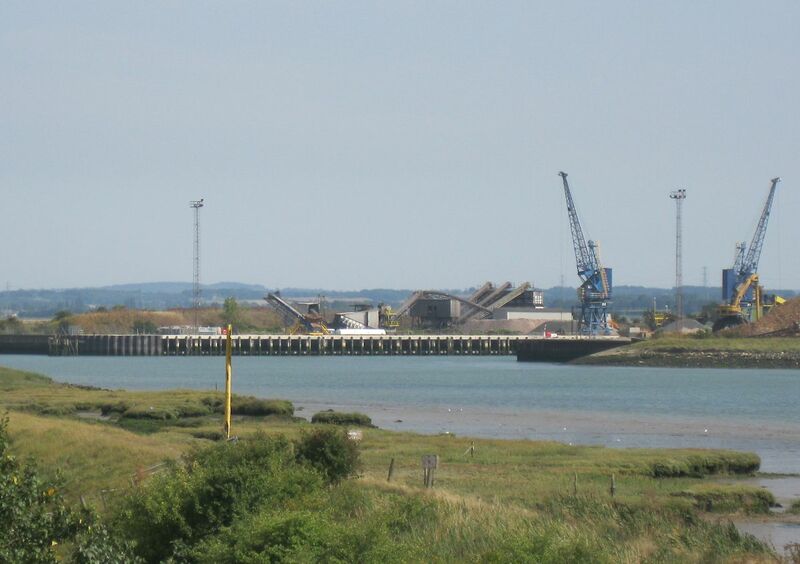 Ridham Dock is located on the River Swale close to Sittingbourne in north Kent. It has good access to the UK road network enabling cost effective distribution throughout the South-East. It was established during the First World War for loading ammunition. Later it was used for importing raw materials for the manufacture of newsprint at the Kemsley Mill, approximately 2km to the south of the dock. The port is connected to the UK rail network and has ample open storage and 11400 square metres of warehousing. Vessels up to 5000 DWT can be accommodated and a wide range of cargoes are handled including coal, aggregates, steel, timber, wood pulp, grain and scrap. Grain and other bulk cargoes can be loaded direct from road transport to ship's hold using a 23m long electric conveyor with a capacity of up to 250 tonnes per hour. A 40 tonne capacity crane is available for handling containers and heavy pieces.